If you are selling your home during the fall, it is important to keep its exterior well-maintained and create a welcoming, cozy atmosphere indoors. Here are some ways to ensure your home appeals to as many prospective buyers as possible. Mow your lawn and remove leaves and debris. Weed, get rid of dead flowers and trim back all branches and foliage so that everything looks neat, clipped and in keeping with the season. Give your flower beds a splash of color by adding some plants that flower in the fall, such as chrysanthemums, coneflowers, and salvias. Place seasonal flowers in large pots on both sides of your front door. Give your front door a fresh coat of paint and hang up a wreath made from seasonal flowers and foliage. This will provide the perfect finishing touch for your entrance area. Is your home exterior clean and free from paint chips or does it need to be pressure-washed and re-painted? Make sure the windows are clean. Do not forget to remove leaves, foliage and other wind-blown material from your gutters on a regular basis. Remove clutter from all surfaces each day and keep as many personal items as possible out of sight. This can be a challenge now that the children have gone back to school, so ensure that they put away their school work, backpacks, and other school-related items each evening. Don't let Halloween decorations overpower your home. Prospective buyers may find it hard to look beyond the decorations and see your home's true features and advantages. 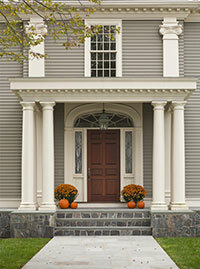 Add just a few, well-chosen and tasteful decorations, such as a small collection of pumpkins at your front door. Create a warm, cozy atmosphere that will encourage people to fall in love with your home. Adjust the temperature on your thermostat before each viewing to ensure that your home is comfortable and welcoming. Another way to create an inviting atmosphere is to add touches of warmth to each room. Place a fleecy throw on the arm of a comfortable chair, pile sumptuous pillows on your bed, and display fluffy towels in the bathroom. Add some well-chosen seasonal decorations, such as a small basket of pine cones, long twigs in a terracotta vase, or a bowl of cinnamon-spiced potpourri. Do not neglect the scent of your home. Air fresheners and scented candles in such fragrances as apple, cinnamon, and vanilla will give your home an appealing atmosphere.